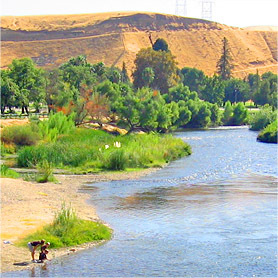 The Kern River flows from the mountains toward the Kern County seat, Bakersfield. FRESNO, Calif. (CN) — Kern County at the southern end of California’s great Central Valley will implement new voting districts and pay plaintiff $3 million in legal fees after disenfranchising Latino voters for nearly a decade. U.S. District Judge Dale Drozd on Wednesday approved the settlement between Kern County and residents who claimed the county’s 2011 district lines were intentionally drawn to dilute the Latino vote and protect incumbents. The 2016 lawsuit brought by lead plaintiff Oscar Luna against Kern County and its Board of Supervisors was the first federal Voting Rights Act challenge to a California jurisdiction since 2001. Under the settlement, the county will drop its 2011 redistricting plan and replace it with an interim plan for county supervisor elections through 2020. June elections will be canceled and the new voting lines will take effect for a special election in November. Voters will choose commissioners in three of the five districts. County commissions are powerful forces in California, having a large say in development projects and environmental enforcement. The new procedures will create a second predominantly Latino voting district that will allow “Latino voters an opportunity to elect candidates of choice in two of the five supervisorial districts in the interim redistricting plan,” according to Drozd. MALDEF attorneys argued that Latino candidates faced an uphill battle in the heavily agricultural county because of gerrymandering. Though Latinos account for 51 percent of the county population, Latino voters have been able to elect only one supervisor to the county’s five-member board. Agriculture is the county’s largest business sector, providing more than 53,000 jobs. Kern’s largest cash crops are dairy, grapes, citrus and almonds. In the 2010 Census, the strongly Republican county about the size of New Jersey had a population of 839,000. Wednesday’s settlement came after an 11-day trial featuring testimony by renowned labor activist and Kern County resident Dolores Huerta and current and former Latino county supervisors. Drozd ordered the county in March to craft fairer voting districts in time for 2018 elections. MALDEF called the order and settlement a landmark win.